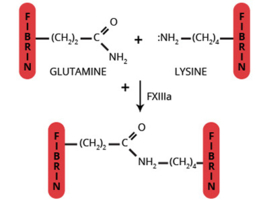 The conversion of soluble fibrin to an insoluble fibrin clot is catalyzed by the transamidase factor XIIIa. Lysine and glutamine side chains of α- and γ-chains of fibrin are crosslinked to form homopolymers. Factor XIIIa (FXIIIa) (fibrinoligase, plasma transglutaminase, fibrin stabilizing factor, E.C. 2.3.2.13) is a glutaminyl-peptide γ-glutamyl transferase functioning in the final stages of the coagulation cascade, stabilizing the fibrin clot by crosslinking the α and γ chains of fibrin to form homopolymers (1-4). Several unique features of FXIIIa set it apart from proteins with which it is generally associated. Factor XIIIa is the only non-proteolytic enzyme of the coagulation cascade. Unlike other transamidases, it exists totally in zymogenic form and is the only sulfhydrylase enzyme which functions extracellularly. Plasma FXIIIa is a tetramer, (Mr=312,000), composed of 2 pairs of non-identical subunits (A2B2) (4-7). Platelet FXIII is a dimer (Mr=46,000), composed of only a pair of identical A subunits (A2) as is factor XIII from all intracellular sources (7-11). The A subunit contains 6 free sulfhydryl groups, one of which is the active center (12). The conversion of plasma FXIII (A2B2) to the active transglutaminase, FXIIIa (A2') results from the thrombin catalyzed hydrolysis of the Arg36-Gly37 peptide bond at the NH2-terminal of the A subunit (13). The conformational change induced by this cleavage results in exposure of the active site cysteine. Full activity is achieved only after the Ca2+ dependent (Kd=10-3M) dissociation of the B subunit dimer from the A2' dimer (14-16). Dissociation of the A2'B2 complex is enhanced by binding to the region of fibrin(ogen) containing residues 242-424 of the Aa chain (14-16). Thus, at normal plasma concentrations of FXIII (90 nM), fibrinogen (8 µM) and Ca2+ (2.5 mM free), all the FXIIIa generated would be in the fully activated (A2') molecular form. Other physiologically relevant crosslinked complexes generated by FXIIIa include fibrin-fibrinogen (17), fibrin-fibronectin (18), fibrin-vWF (19), fibrin-α2-antiplasmin (20), fibrin-actin (21), fibrin-thrombospondin, fibronectin-collagen (19), vWF-collagen (19), actin-myosin (21,22), factor V-factor V (23). In addition to clot stabilization, FXIIIa is thought to function in various processes involving cell proliferation, such as wound healing, tissue remodeling, atherosclerosis, and tumor growth. Plasma FXIIIa is generated by cleavage of homogenous plasma FXIII by alpha-thrombin, in the presence of EDTA. The A2'B2 subunit is purified by ion and affinity chromatography and supplied in 50% glycerol, 0.5 mM EDTA for storage at -20°C. Usage: To dilute please use a physiologic buffer such as HBS or TBS that contains ETDA to 500 micromolar. Aliquot usable sized amounts, and freeze (at -70C) the vials not being used that day. While in use keep vials on melting ice. In the non-reduced sample the A chain shifts down toward the B chain following activation. McDonaugh, J., in Hemostasis and Thrombosis, 2nd Edition, eds. R.W. Colman, J. Hirsh, V.J. Marder, E.W. Salzman, pp. 340-357, Philadelphia: J.P. Lippincott Co., 1987. Lopacink, S., et al., Thromb. Res., 8, 453 (1976). Takagi, T. and Doolittle, R.F., Biochemistry, 13, 750 (1974). Kamaide, H. and Shainoff, J.R., J. Lab. Med., 85, 574 (1975). Mui, P.K. and Ganguly, P., Am. J., Physiol., 233, H346. Cohen, L., et al, Arch. Biochem. Biophys., 192, 100 (1979).